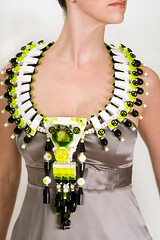 Now I've seen crafty looking LEGO jewelry that looks cool, but this LEGO jewelry really elevates the art form to a new level. There's also a few "artist's process shots" here, here, and here. Have you seen Emiko's jewelry on ObjectFetish.com? Check it out. It is incredible.